I love this value-priced, heavy duty pan. 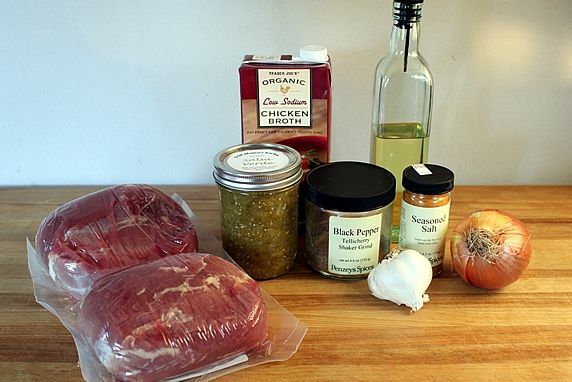 It can go from the stove top to oven and does an amazing job on meats, stews, chili, and more. It's easy to use and programmable. I love the automatic warm setting. A top pick of Cooks Illustrated. This is the best gadget I've found for easily separating the grease from the broth, and that means you can discard unnecessary fat and calories. This 4.8-quart Pyrex dish is a great size for roasting meats and vegetables, and for making large casseroles. 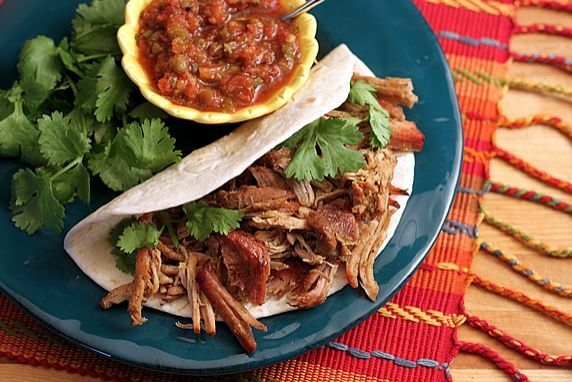 This slow cooked, mildly seasoned, low-fat pork is versatile for use in a variety of Mexican dishes. Step 1: Pat pork pieces try with paper towels; sprinkle with seasoned salt. In Dutch oven over med-high heat, add canola oil and brown pork pieces on all sides. 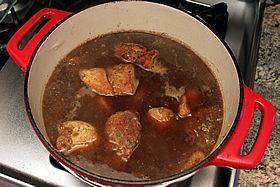 Remove pork and set aside; add chicken broth and deglaze the pan, stirring in the browned bits from the bottom. Step 2. Slow cook the pork using one of these options. 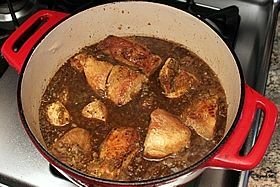 STOVE TOP OPTION: Add pepper, garlic, onions, and salsa verde to broth in pan and stir; add pork pieces back in. Bring to simmer, cover and simmer on lowest setting until pork is fork tender (approx. 2-1/2 to 3 hours). 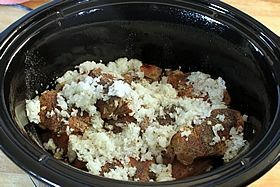 SLOW COOKER OPTION: Place browned pork pieces in slow cooker. Pour on the chicken broth liquid that was used to deglaze the Dutch oven. Sprinkle on the black pepper; top with the garlic, onions, and salsa verde. Cover and cook on high for 3-1/2 to 4 hours or on low for 7-9 hours, until fork tender. Step 3. Transfer cooked pork to cutting board and shred it using two forks; discard fat. Degrease the cooking liquid left in the pan. Step 4. Preheat oven to 300 degrees. 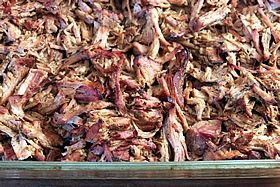 Spread out the shredded pork in a large shallow baking pan. 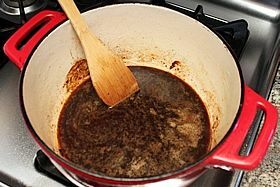 Pour up to 3 cups of the degreased cooking liquid over the pork. Bake uncovered for 30 min. or until crispy pieces appear on top. Remove from oven and stir. Return to oven for 20 minutes or until crispy pieces appear again on top. Repeat baking, crisping, and stirring in 10-20 min. intervals until all or most of the liquid is gone from bottom of pan. For a moister meat, cook until approx. 1/4" liquid remains on bottom of pan, stirring remaining liquid back into the shredded pork. 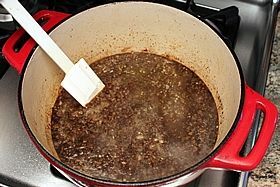 For dryer/crisper meat, cook until all liquid has cooked away. --a filling for tacos, burritos, fajitas, chimichangas, enchiladas or a topping for nachos. 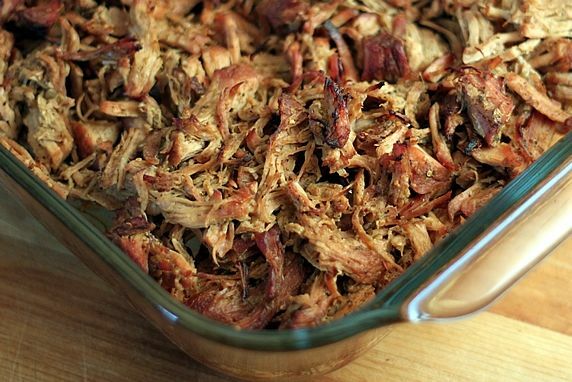 This slow cooked, mildly seasoned, low-fat pork has been a favorite in our home for many years. The original recipe came from my mom (aka Grammy). Carnitas (translation: "little meats") was one of the meat selections at the Mexican Buffet Party we had last fall where we served a Taco Bowl Bar. This freezes well and is great to have on hand as a filling for many Mexican dishes like tacos, burritos, nachos and enchiladas. It's also good on sandwiches. 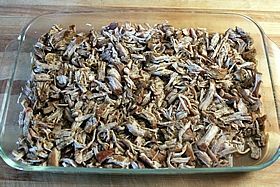 I always make a double batch of carnitas while I'm at it, because it has so many uses for a variety of meals. The pork is first browned on the stove top. 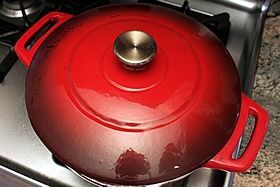 Then the slow cooking takes place either in a Dutch oven on the stove top or in a slow cooker; I cook it both ways depending on whether or not I'm home to tend to it while it cooks. The final step is to brown the shredded pork in it's own juices in the oven. That's where the flavor really gets infused into the meat. The result is tender, flavorful pork with browned, crispy bits mixed in. Yum! 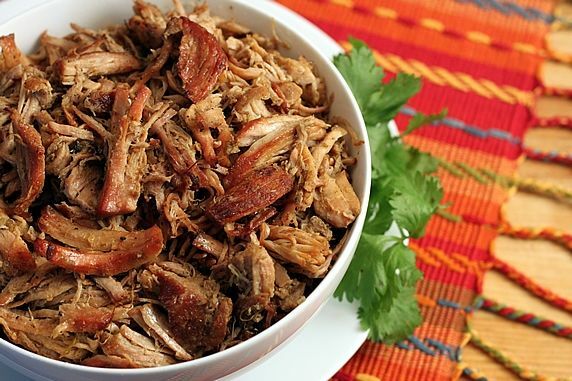 Many carnitas recipes call for a fatty cut of pork. I won't argue that the fat does add flavor and crispiness. But, in the spirit of healthy eating, I use the leanest pork roast I can find. 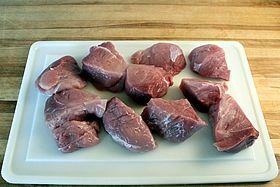 My method results in flavorful, moist meat without the fat. Here's how I do it. 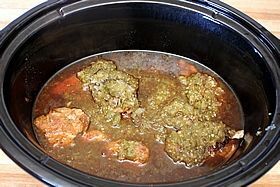 *"Salsa Verde" is normally a blend of tomatillos, green chiles, and other seasonings. It may also be called Green Salsa/Sauce or Tomatillo Salsa/Sauce. Sometimes it has a lot of heat, sometimes not. Although I normally make my own salsa verde now, I have used many store bought varieties in the past. 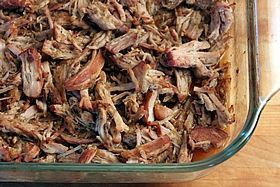 They've all turned out well with this carnitas recipe, so you don't need to sweat finding exactly the right one. My advice is to look for a jar with recognizable ingredients and as few additives/preservatives as possible. Step 3. Cut off any visible fat from the outside of the pork roast. Mine was so lean that there wasn't any fat to remove. Cut the roast into 3-4" chunks. Step 4. 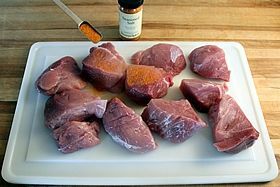 Pat the pork dry with a paper towels and sprinkle the pieces with seasoned salt. Step 5. 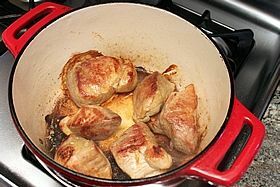 In a Dutch oven over medium-high heat, add 2 tablespoons canola oil and add the pork and cook until browned. Step 6. 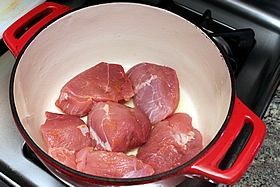 As the pork browns, turn the pieces with tongs and let them brown on all sides. Remove the pork to a plate (or the slow cooker if you'll be using one). There will be browned or blackened bits on the bottom of the pan. 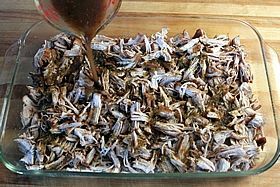 This will add important flavor and color to the carnitas. Step 7. 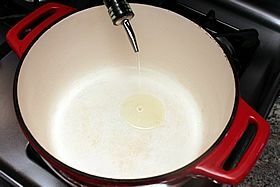 Add chicken broth to pan and stir with a flat bottomed spatula to remove the browned bits and stir them into the liquid. Now it's time to choose to do the slow cooking on the stove top or in a slow cooker. I'll explain both options. OPTION 1: Slow cook the pork on the stove top. Step 8. 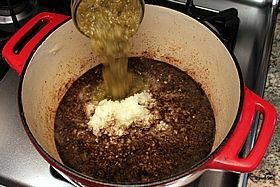 Add the black pepper, onions, and salsa verde to the liquid and stir it all together. Step 9. Return the browned pork pieces to the pan. Step 10. 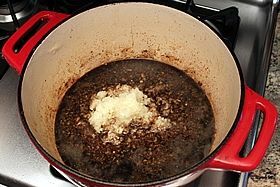 Cover and simmer at the lowest heat setting until meat is fork tender, 2-1/2 to 3 hours. 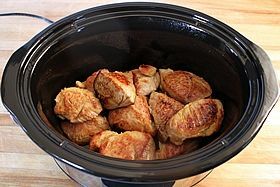 OPTION 2: Slow cook the pork in a Slow Cooker/Crock Pot. Step 8. 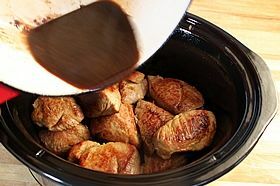 Transfer browned meat to a slow cooker and pour the liquid (from the browned bits and chicken broth) over the top. I'm using a 6-1/2 qt Crock Pot. Step 9. Add the pepper, onions, and salsa verde. Step 10. Cover and cook on high for 3-1/2 to 4 hours or on low for 7-9 hours, until fork tender. 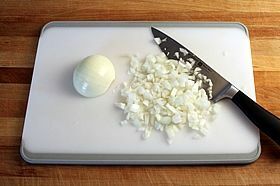 Make ahead tip: If you want the slow cooking to take place while you're at work or away for the day, complete steps 1 thru 9 and refrigerate the night before. 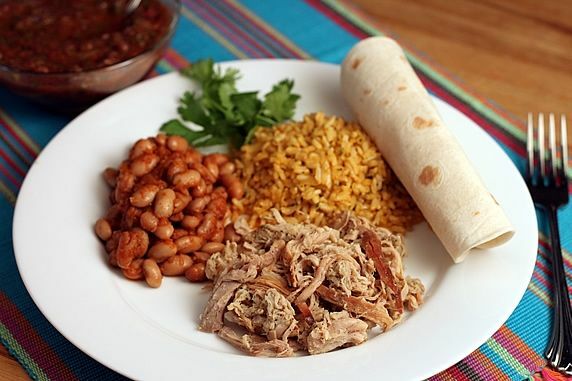 The next morning, plug in your slow cooker and time it so the carnitas are cooked when you get home later in the day. 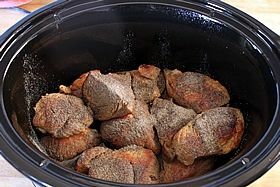 If possible, let the pork warm to room temperature before starting the slow cooker; or, allow extra cooking time. Step 11. 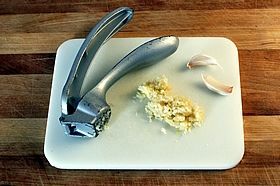 Remove the cooked pork to a cutting board and shred using two forks, discarding any fat. Step 12. 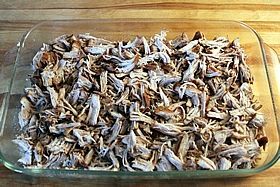 Transfer shredded pork to large shallow baking dish. I'm using a 15x10x2" pyrex baking dish. Step 13. 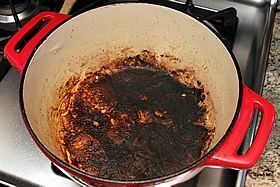 If necessary, degrease the cooking liquid left behind in the pan. I use a degreaser gadget to make the task easier. However, with this particular batch of carnitas, my pork was so lean that degreasing wasn't necessary. My cooking liquid had virtually no visible grease, so no degreasing required this time. Step 14. Pour cooking liquid/broth over shredded pork. 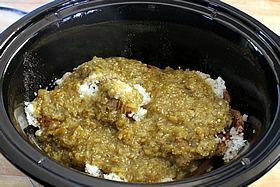 The amount of liquid you have can vary; there will probably be more than you need if you've used a slow cooker. 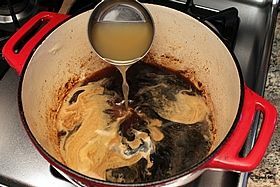 Don't use more than 3 cups of the liquid for this step, or it will be too much to cook off. Step 15. Place uncovered in a 300 degree oven and cook until crispy on top, approx. 30 minutes. Step 16. Remove from oven and stir. Return to oven for another 20 minutes, or until crispy on top again; stir and return to oven. Continue this cycle of baking until crispy, stirring and returning to the oven until most of the liquid is gone. As the liquid evaporates, it's flavor concentrates into the meat. 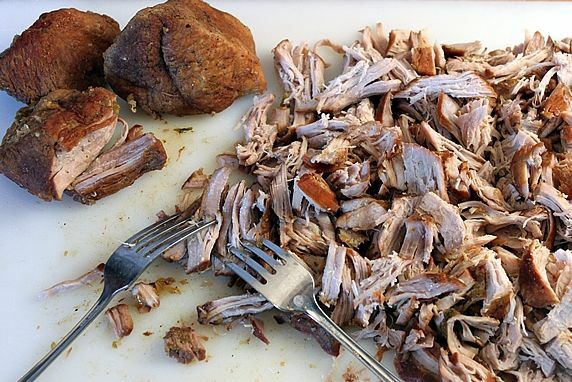 Some people prefer their carnitas crispy and dry throughout. I prefer mine with some browned bits, but still moist. So, I stop baking the meat when there is still approx. 1/4" of liquid left in the bottom of the pan. I stir that liquid into the meat to provide some moisture. If you prefer a drier, crispier meat, continue baking until all of the liquid is gone from the bottom of the pan. 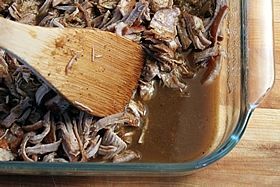 This meat gets its yummy flavor from the combination of slow cooking, oven browning, and concentration of the liquid back into the meat as it bakes. So delicious! 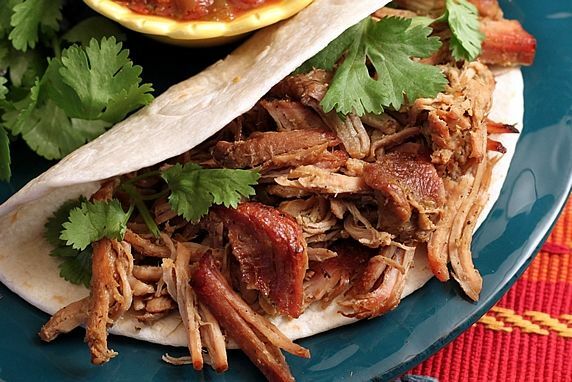 There are many ways to serve carnitas. An easy way is to serve it fajita-style along with rice, beans, salsa, guacamole and tortillas. a filling for tacos, burritos, fajitas, chimichangas, quesadillas, enchiladas or a topping for nachos. 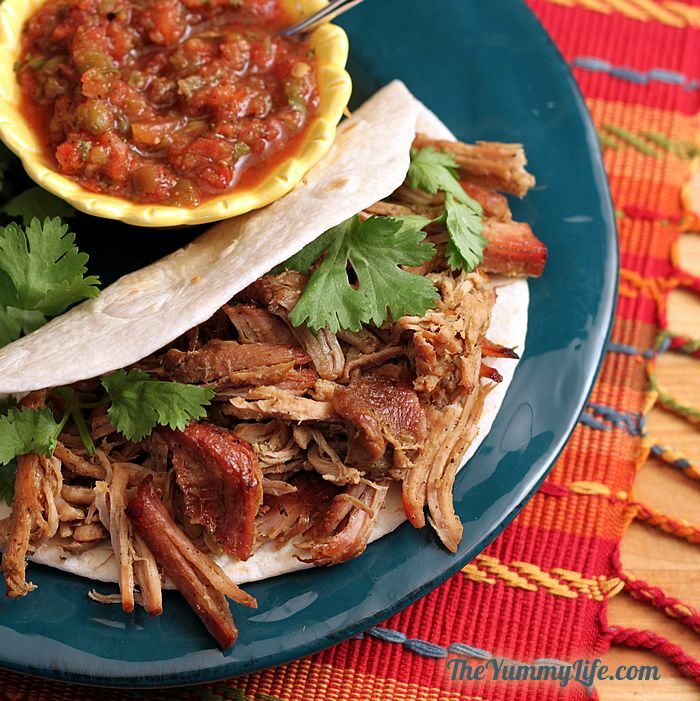 This Carnitas Shredded Pork is great in a Tortilla Bowl Taco Bar.